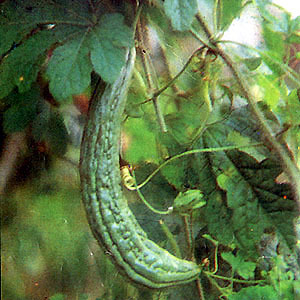 Ampalaya is a vegetable grown throughout the Philippines. It is mostly cultivated, although wild forms can be found. It grows wild in the remote areas of Mt. Banahaw. As the English name suggests, the melon has a bitter taste due to the presence of momordicin. There has been much research done on the effectiveness of using Momordica Charantia in the treatment of diabetes. It has been shown to increase production of beta cells by the pancreas, thereby improving the body’s ability to produce insulin. It has been recommended by the Department of Health of the Philippines, as one of the best herbal medicines for it’s ability to help with liver problems, Diabetes and HIV. It is a common herb used in Chinese herbology. In the Philippines, the leaves are often used for children’s coughs. It is also used in the treatment of skin diseases, sterility in women, as a parasiticide, as an antipyretic, and as a purgative. This entry was posted in List of Medicinal Plants in the Philippines and tagged amagroso, ampalaya on March 6, 2009 by Pinoy Herbs.